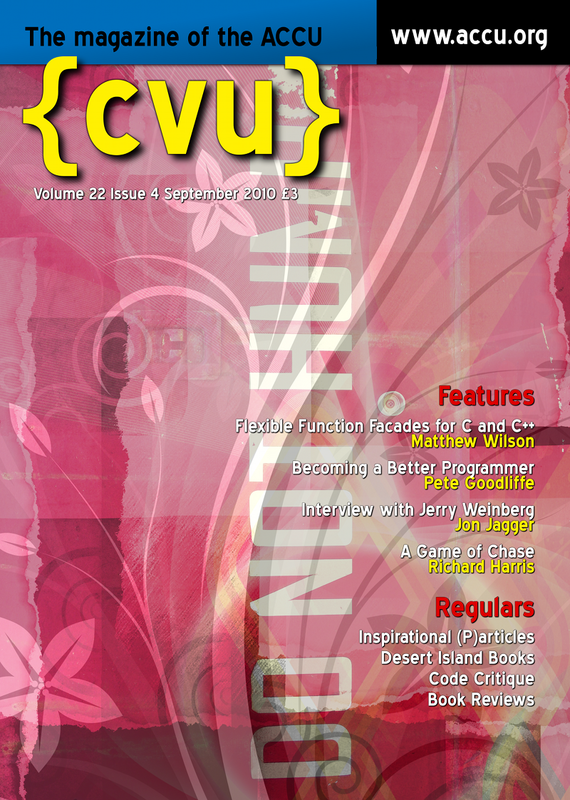 Issue 22.4 of ACCU's CVu magazine is out, containing my latest column. This month it's called People Power. It describes the importance of working with high quality, passionate programmers. This issue, though, has seen a very significant change in my column. For over ten years now I've been regularly writing a column entitled Professionalism in Programming. (I originally named it after the ACCU's "motto".) Times change, and although there's nothing wrong with the title per-se, it doesn't reflect clearly and unambiguously what I've been writing about. So I've changed the column's name. I now call it Becoming a Better Programmer. I think this is clearer, snappier, and more useful. I hope you agree! I've also modified the way I tackle topics somewhat. I hope you'll appreciate it. The magazine should have landed on ACCU members' doormats already. The PDF version is available for download on the website. (And yes, for the cover I have been working through my "pink phase").